The Oklahoma City Thunder are not the only team with a damaging fourth-quarter play. In Game 7 against the Boston Celtics, the Miami Heat went to their own unstoppable set that could be very problematic for the Thunder. The Heat use LeBron James off the ball to exploit the attention he commands. At the start of the fourth quarter, the Miami Heat were down by two points, so they went to their sure-fire play to regain the lead. The play starts with Udonis Haslem and LeBron James setting up in a “horns” formation at the elbows, with Chris Bosh and Shane Battier setting up in the corners. When the ball becomes live, James sets a screen for Haslem, and they switch sides of the court. Next James and Haslem run toward the ball to set high screens on both sides of the court. 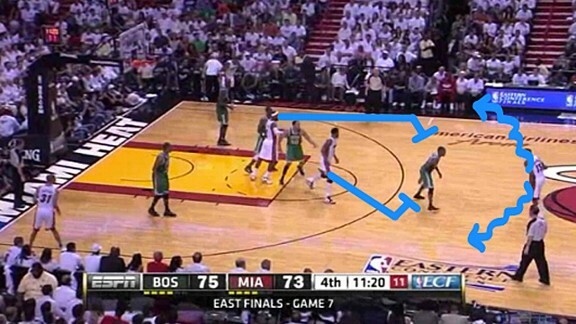 Essentially, the Heat set a double screen for Mario Chalmers and give him the choice to go to either side. 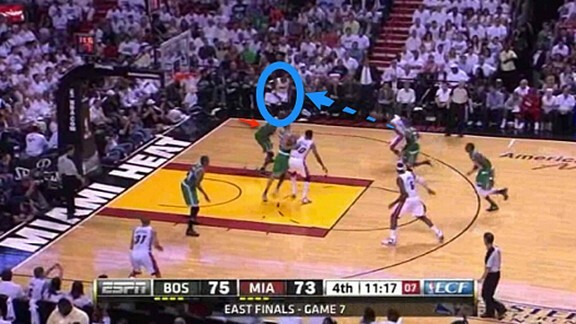 On this particular possession, Chalmers decides to turn the corner off James’s screen. 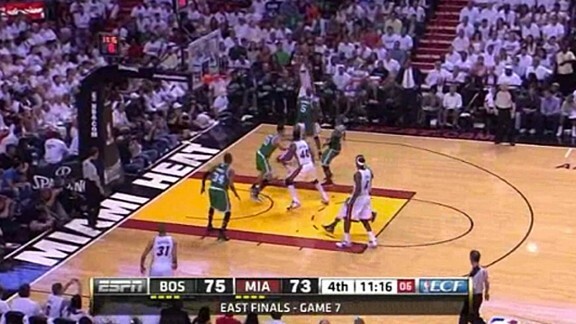 Boston defends the pick-and-roll by attempting to prevent precisely this. Thus, Mickael Pietrus, who had been covering James’s defender, shows as Rajon Rondo, Chalmers’s defender, works over the screen. But because Pietrus also has to worry about James, he does not show hard and Chalmers can make the move he wants. 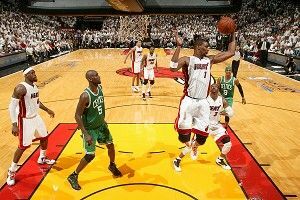 Kevin Garnett has to leave his man, Bosh, to close in on Chalmers as he attempts dribble penetration. 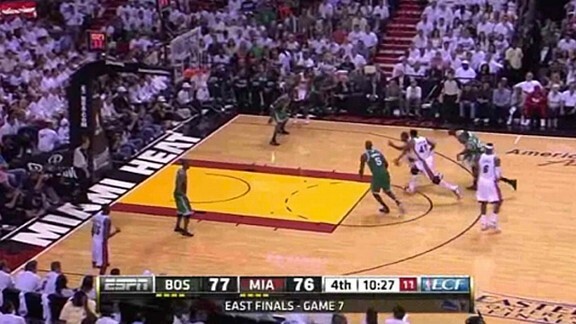 Chalmers makes the clear choice to kick out the pass to the corner, where he finds Bosh. Pietrus’s concern over James derails Boston’s defensive strategy. He knows that he’s supposed to be showing hard enough to keep Chalmers from turning the corner, but he also knows that he needs to get back to James very quickly. All Pietrus can commit to is a halfhearted poke at the ball. Even when James isn’t the screener on this play, it can still be devastatingly effective with LeBron influencing it. This time, Dwyane Wade is the ball handler with Haslem and James setting screens on either side. 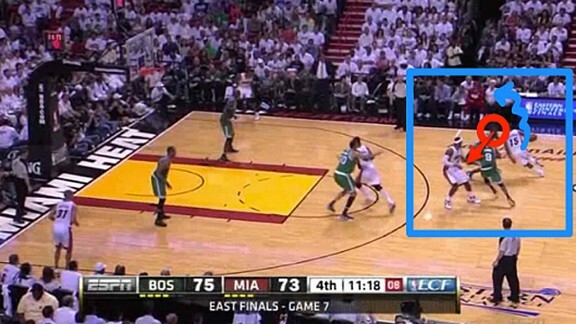 Wade chooses to use the screen set by Haslem, who is now guarded by Pietrus. Wade splits the defense and attacks the rim. This is where the positioning of the rest of the defense is important. Because this is a horns set with two shooters in the corner (yes, Bosh is considered a shooter because he just knocked one down), the defenders have to stay close. 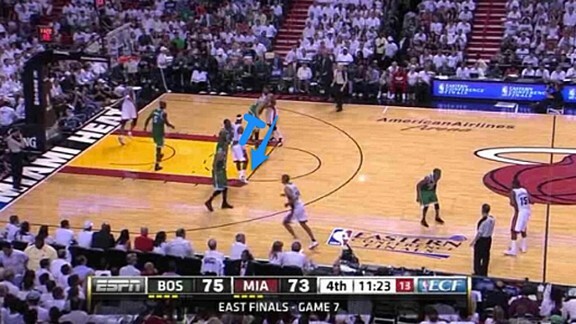 Most importantly, Garnett is covering James very closely. Garnett should be sinking in the middle to defend against dribble penetration or someone rolling to the rim, but he can’t leave James. There is nobody in the paint to stop Wade, and the guys in the corner can’t help. Let’s look at that first “token” screen between James and Haslem. I didn’t understand the purpose of it the first time Miami ran this set, but this possession shows why it’s necessary: to protect against and exploit a defensive switch. 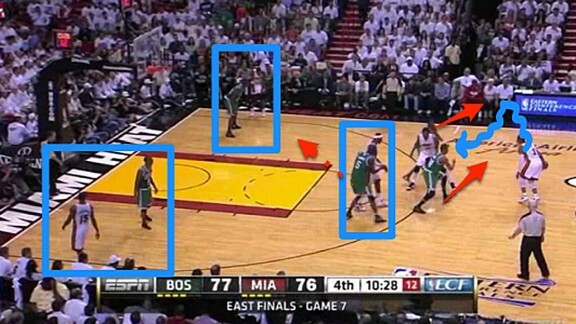 Pietrus is uncomfortable guarding Haslem, and likewise Garnett is uncomfortable guarding James. 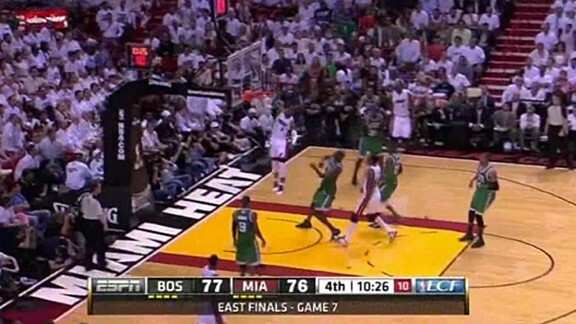 Miami exploits this to get an easy basket. After seeing Oklahoma City run their pin-down play with multiple options, a lot of people wondered how Miami (or Boston at the time) would stop it. This play has me asking the same question. How will the Thunder defend this play? The fourth quarters of these Finals are shaping up to be an interesting Xs-and-Os battle that will be fun to watch.